Just looking at this picture makes my mouth water. I love rice and I love jasmine rice even more. So I figured why not combine the foods I love the most with the flavors I love the most. 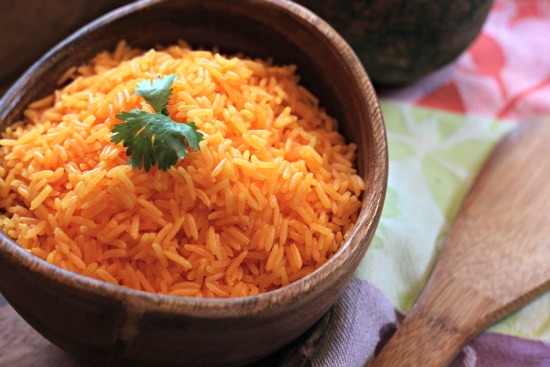 So I cooked this pot of rice with rich Latin flavors and colors and the result was spectacular! I used Achiote/Annanto these terms are used interchangeably. It is a culinary spice used as a colorant but in larger amounts it imparts an earthy, peppery flavor with a little bitterness. It can be used in place of saffron and it's a who;e lot cheaper. I personally prefer this over saffron because I believe the saffron imparts too much of a musty flavor. Traditionally it was used for much more then cooking. They also used it as cosmetics, fabric dye, body paint, sunscreen, insect repellent, and as medicine. Interestingly enough it was also used to treat Diabetes, snakebites and epilepsy. However, I use it because it taste good. strain through a colander with absorbent paper inside and pour into glass container. Store in the refrigerator and use as needed for recipes. Add achiote oil and salt into heated pot. Pour 3 cups of water and add 1/2 envelope of sazon. Bring to a boil. Add rice, mix lightly. maintain medium fire until the water evaporates almost completely. Turn rice over a few times, lower heat and cover. Cook for additional 15-20 min. My name is Doreen and I love to eat. My daughter Who was only 16 at the time, and I were diagnosed with celiac disease in 2008. I created this website to share our gluten free lifestyle. I gained 15 pounds after my diagnosis because I always felt deprived. I decided I would recreate all of our favorites, gluten free. However, being of Puerto Rican descent, I soon realized all the good stuff was very high in fat. I embarked on a mission to not only recreate the foods we love but to make them low in fat.